Q1 Which city will host the 2015 Men’s World Championship? Q2 Which recent tournament did Squash Player’s July Player of the Month Declan James win? 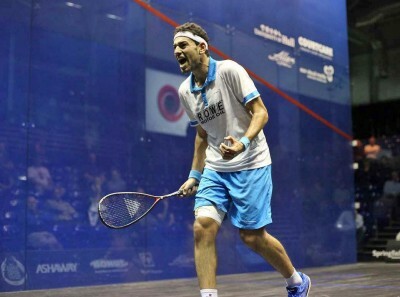 Q3 Squash is bidding to participate in the 2020 Olympic Games. Which city will this be held in? Racket of world no.1 Mohamed Elshorbagy, the Carboflex 125 is designed to provide maximum performance for the modern squash player, featuring Basaltex Transmitters, Isomoph Shaft Technology, Custom Fit Bumper Technology and 305+ Black string.